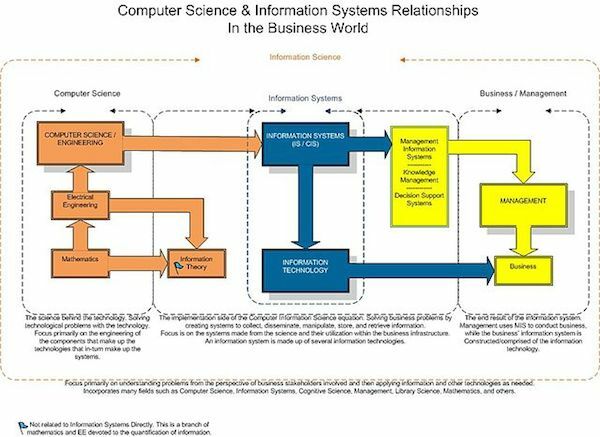 The relationship between Information Science, Computer Science, Information Systems and Management. Computer information systems degrees provide a flexible and convenient way for you to qualify for a career at the forefront of change. The US Bureau of Labor Statistics has estimated that information technology is one of the fastest growing fields in the economy. This means that organizations require trained personnel in the field if they are to stay head in the global, competitive environment. Well-paid computer information systems jobs can be found in: computer design services, insurance companies, software publishers, data processing services, securities and commodities companies, telecommunications, and financial institutions. Getting a computer information systems degree is a crucial ingredient to success, providing a valuable education to get started in the technology field. It will provide you with the technical and business skills that are necessary to help you understand and use technology to your benefit in a computer information systems career. Computer information systems programs are available at the certificate, associate, bachelor’s and master’s level. This page has more details of the programs, the schools, career prospects, and more. You might also like to check the information systems degrees page. What do you study in computer information systems degrees? Those who enroll in a degree in computer information systems will find that it is a science-intensive degree. Students will also be required to take a number of courses on computer systems and software, to learn how to make sure these systems are operating correctly and working well together. Courses might include: data communications, networking, computer programming (including SQL and other database query and programming languages), telecommunications technologies, hardware and software, and systems development and analysis. Some programs offer training in proprietary software, such as Cisco, Microsoft, or Oracle. You will also probably have a few management courses as well. A bachelor of computer information systems degree program will often offer specializations in areas such as: business management, management, enterprise computing, health information systems, information systems security, systems analysis and integration, computer forensics, web development and administration, web game programming. You might also like to consider management information systems (MIS) which cover the skills to be able to manage data systems and use technology tools for more effective management of businesses. You can also get a Computer Information Systems (CIS) certificate after having graduated with a different degree, or in a different specialization. These certificate programs enable you to specialize and obtain expertise in certain areas such: End User Support Specialist, Network Specialist, Database Analyst, Programmer/Analyst, or Web Developer. Students who choose to get this certification after getting their degree will find that they have the advantage when it comes to the job market. It usually takes around one year to complete this certification. What are the prospects for graduates with computer information systems degrees? Computer systems design and related services $118,120. It is a very well paying field, overall, but keep in mind that it takes a good education to get involved in it. Many will choose to advance their career after a few years of working in this field. A Masters degree can be easily found online, and the individual can continue working and gaining experience while training for better career opportunities in the future. The demand for Information Systems Managers is growing rapidly in the United States, and this is a job that requires a Masters degree in most cases. These individuals usually make an average of $112,210 annually.